HTC Flyer is the first tablet produced by HTC. Flyer is powered by Android 2.3, using a 7-inch touch screen with resolution 1024*600, 32GB of storage memory, 5.1 megapixel autofocus camera for photo, 1.3 megapixel forward-facing camera for video calls. The overall impression of the HTC Flyer is pretty good. 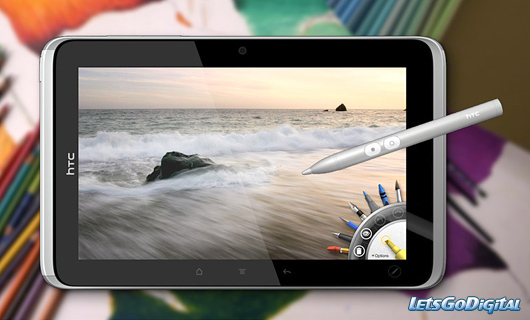 This tablet is suitable for movies playback. You may want to put your favourite DVD discs on flyer for playing, first, you need to rip the discs to get the original DVD video. However, this video still can’t be played by Flyer. Then, you should convert the ripped video to flyer supported video formats. The process seems complex. If we have an all-in-one tool, everything seems simple. Pavtube DVD Ripper is just the one you need, it can help you to rip and convert DVD discs to any popular formats. It also can handle DVD ISO or IFO image files. Moreover, it’s easy to use, even you are a beginner, you can operate it successfully. Here is the step by step guide to help you converting DVD movies to HTC Flyer supported video formats. Step 1. Download and install Pavtube DVD to Flyer converter on your computer, run it and load your DVD files into this program. Step 2. Choose HTC Flyer video formats, below is the formats supported by HTC. As you see, you should choose the output from the above, here i recommend you “ android- Motorola droid x h.264 video mp4 ”, then just set the size “original ” as “1024*600″ to get full screen effect. Step 3. Start this DVD to mp4 conversion by click on “Convert”. When the process is done, transfer the converted video to HTC Flyer via USB cable. Then you can play DVD movies on HTC Flyer in full screen.